A previous eQSL from Wolverine Radio. Try decoding the one at the end of this recording! For your listening pleasure: 1 hour, 20 minutes of the pirate radio station, Wolverine Radio–recorded May 26, 2014 starting around 1:20 UTC. 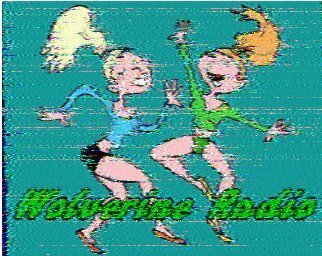 Wolverine was broadcasting on 6,950 kHz in the upper side band. Typical of Wolverine, lots of music variety which spans the decades and no commentary other than station ID throughout. At the end of this recording, you’ll hear an SSTV QSL card being transmitted. Try decoding the QSL image from this recording–it’s quite easy! I usually decode Wolverine’s SSTV QSL with Chris Smolinski’s SSTV app for iPhone, but there are other programs to do this. The eQSL above came from a broadcast about two weeks ago and was submitted by SWLing Post reader, Steve Yoth. This entry was posted in Music, News, Pirate Radio, Recordings and tagged Pirate Radio, Recordings, Shortwave Pirates, SSTV, Wolverine Radio on May 30, 2014 by Thomas.